For centuries, beekeepers have used "skeps,” carefully designed domed baskets, to house their hives. Learn how to make one. For centuries, beekeepers have used “skeps,” carefully designed domed baskets, to house their hives. Bees need a clean, dry place to make a home and “I guess beekeepers got tired of using hollowed out logs,” explains Kennard in a softly accented but very British voice. Northern European beekeepers migrated from logs to straw skeps somewhere between 800 and 1200 AD. Bridal couples in medieval Holland were given a skep to parade around the village as a symbol of starting a new home, and a swarm of bees as a wedding gift. 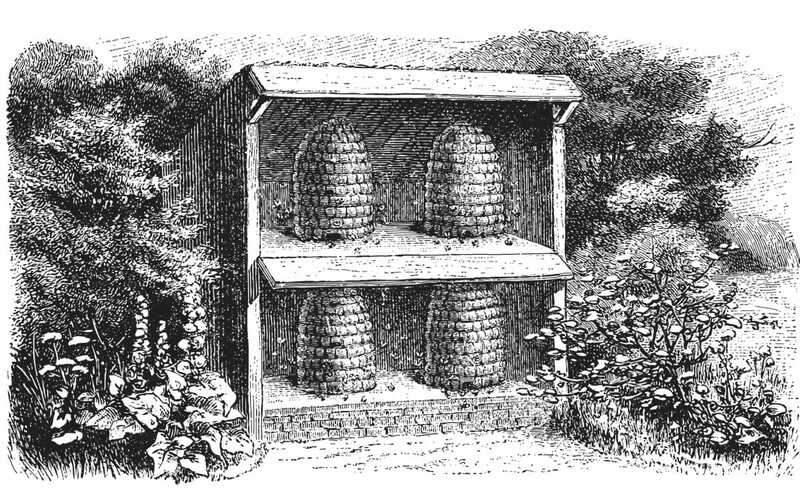 But, once the modern Langstroth box hive was perfected and came into common use, bee skeps fell out of fashion. Today, beekeepers are required to be able to easily open their hives for inspection and mite prevention, so skeps can no longer be legally used to house bees. And, you pretty much have to destroy your hive to get any honey. You can use a skep to capture a swarm, though. And they look pretty sweet and old-timey. 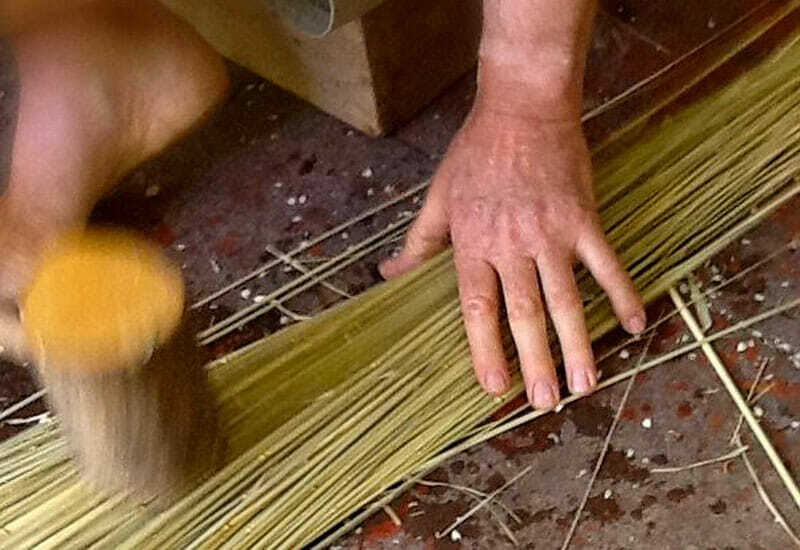 Materials: First you need skep-making straw. Charlie uses “Harding grass” (Phalaris aquatica) which is considered an invasive grass, so gather it freely. Other grasses can be used, like rye straw. You’ll also need some cane for binding the grass together. Dried and split blackberry canes can be used, or purchase 5 mm rattan cane (the kind used to cane chairs). 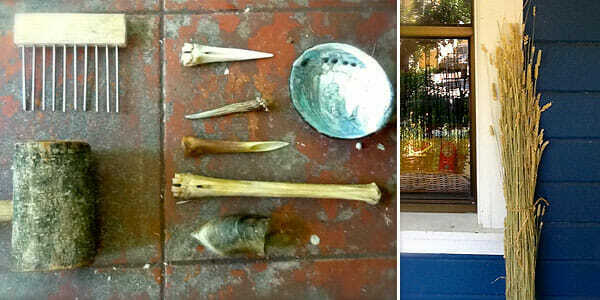 Tools: If you’re going to do it right, you’re going to need old school tools, made from bones and stuff. 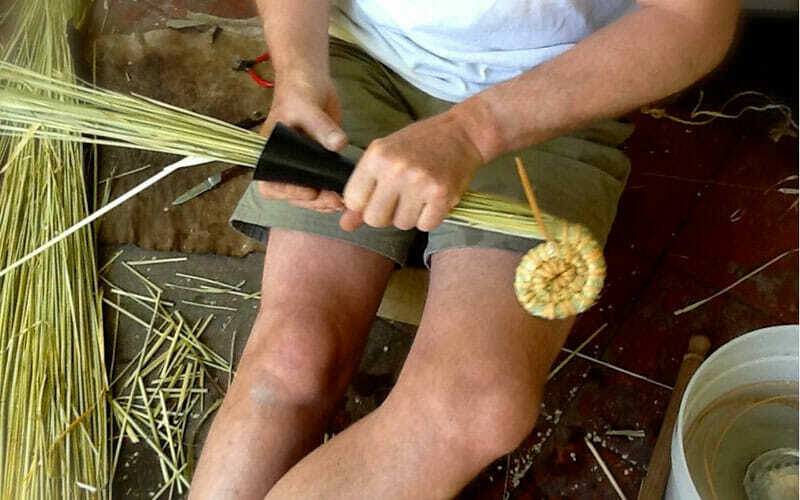 Here’s what Charlie uses: A comb for removing the seed heads and straightening the grass stems, a hollow cylinder – called a “girth” – for shaping the grass coils (this one is made from a cow horn), an awl or two for pushing the cane through the coils of grass (turkey bones work well), a mallet (made from a tree branch), and some water in a bucket with a cup to wet down the canes and make them supple enough to bend (Charlie uses an abalone shell for this). Then you need a lot of free time and some patience. 1. 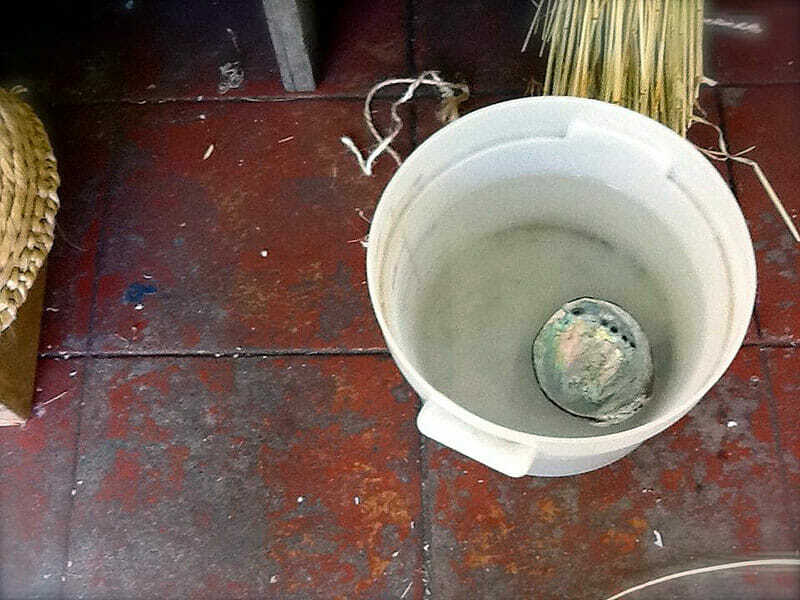 Soak your cane in water. As you take one out, put another in so that you’ll have soft cane throughout the process. 2. Comb out a handful of grass to make sure there are no leaves or seed heads. Smooth, soften and “de-kink” it with your comb. A leg protector can come in handy here, especially if you’re not too good with a sharp things. 3. Make sure your straw is pliable. A mallet helps. 5. Sew the coil. Use an awl to make a space in the coil where you want your stitch and push the cane through the awl space and pull it out the other side. This can get tricky as you make the first coil. 6. 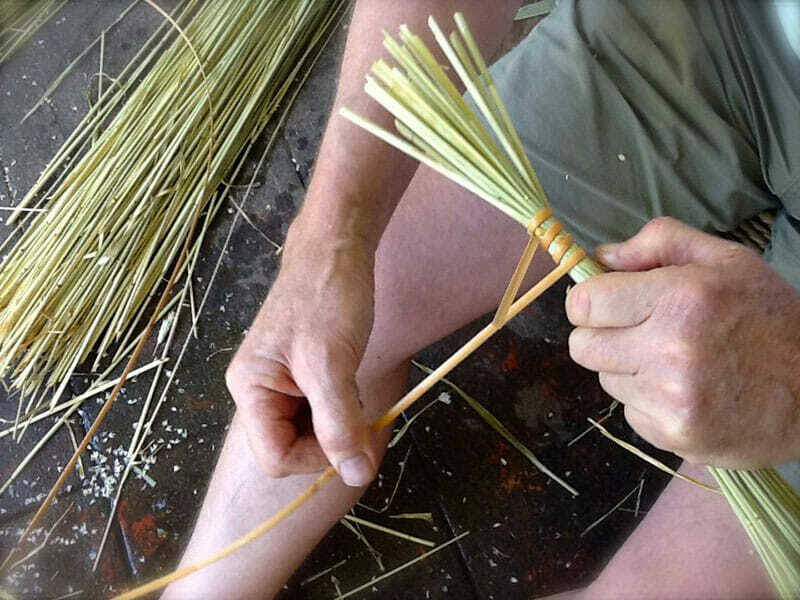 Use the “girth” to add more straw to the end of your bundle. Make sure you put the ends of the new straw inside the existing coil straw so they don’t show. Try to get it to full thickness as soon as you can without making it look lopsided. 7. Stitch it up. Interlock the stitch you’re making with the two stitches right above it in the row you just coiled. Stitch spacing is crucial. 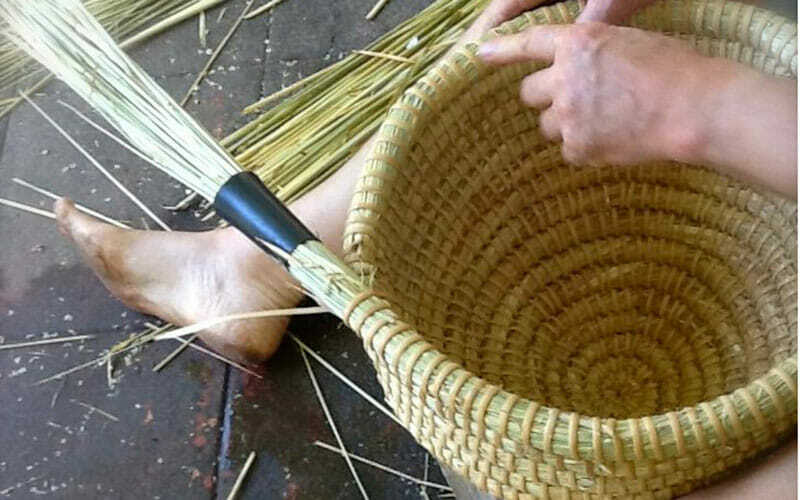 The stitches have to look uniform, If they are too far apart, your skep will look wonky. This is the part that takes days and wrecks your hands. 8. Keep a uniform diameter. 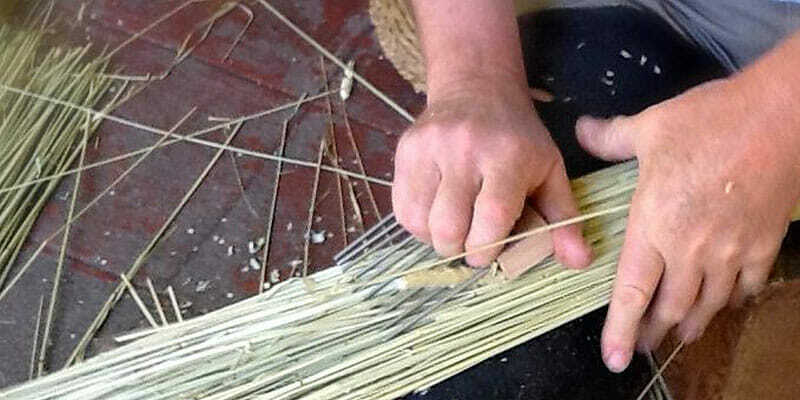 As you are stitching each coil, use a pattern cut of out cardboard that is the exact size of the inside of the skep as a guide to make sure your skep has a uniform diameter. The dimensions of skeps vary by tradition, but most have a slight bulge in the middle, and are narrower at the bottom. It makes carrying them easier. 9. Leave space for an opening. 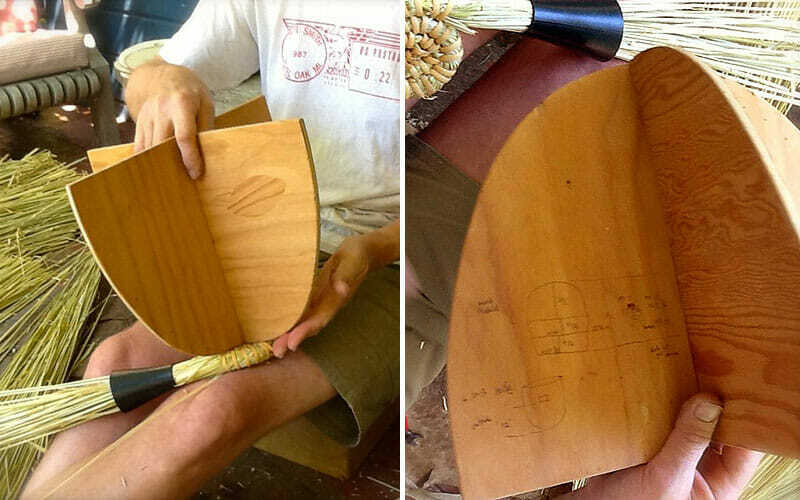 Be sure to leave about a 6-inch space in one coil without stitches for an opening to the skep. Charlie puts the entrance to the skep at about ¾ the distance from the top to allow easy bee access. 10. Cut out the hole. 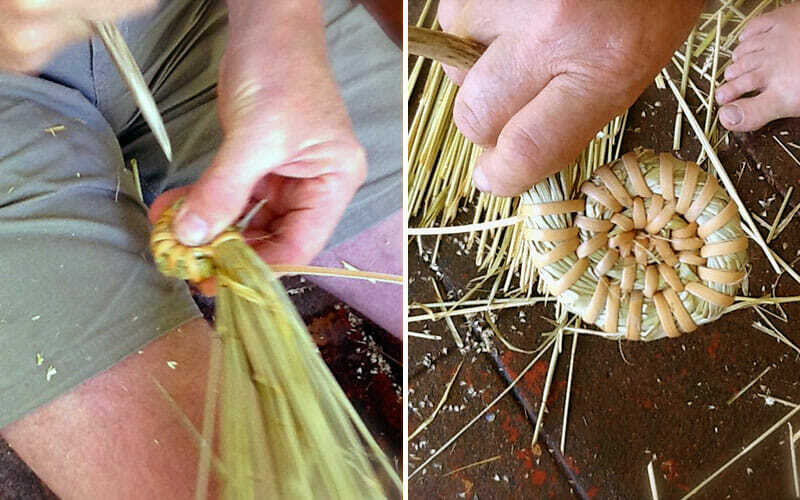 Once the skep is finished, cut out the space you left for the hole. Done. 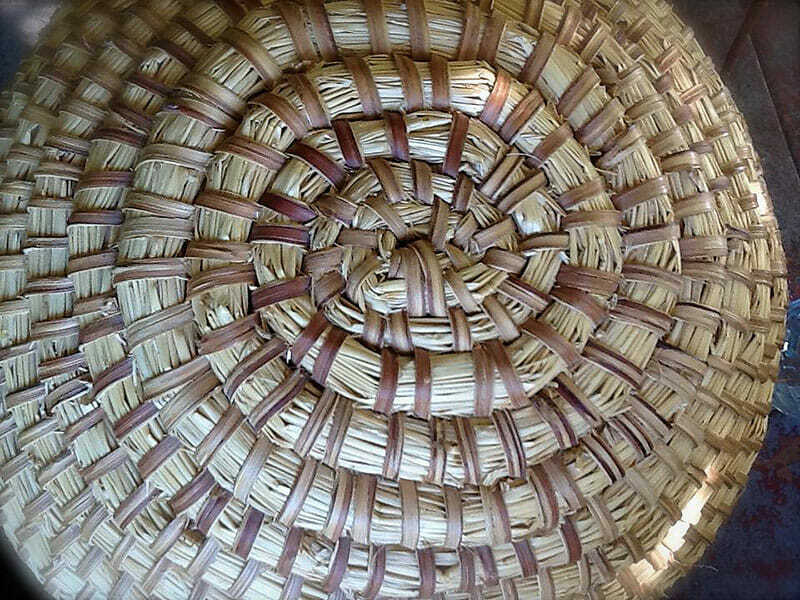 A perfectly made bee skep. If you’re storing it outside, be sure to put it in a little niche, under an eve, or somewhere where it will be protected from the elements. Great guide! I’m going to give it a try, is it ok if I use pics and text from this for a bee hive building workshop? We are building a few different hive types and this is the best guidance I could find so far on skep builds. I wonder what Charlie would consider as a fair price for a good skep? I’ve seen a couple at a historic village called Skansen near Stockholm, and in a book by Dr Eva Crane, about beekeeping, but never really have had the chance to get the feel of working with them. I’ll bet it would be possible to import into Australia? I’ve seen a couple at a historic village called Skansen near Stockholm, and in a book by Dr Eva Crane, about beekeeping, but never really have had the chance to get the feel of working with them. I’ll bet it would be impossible to import into Australia? 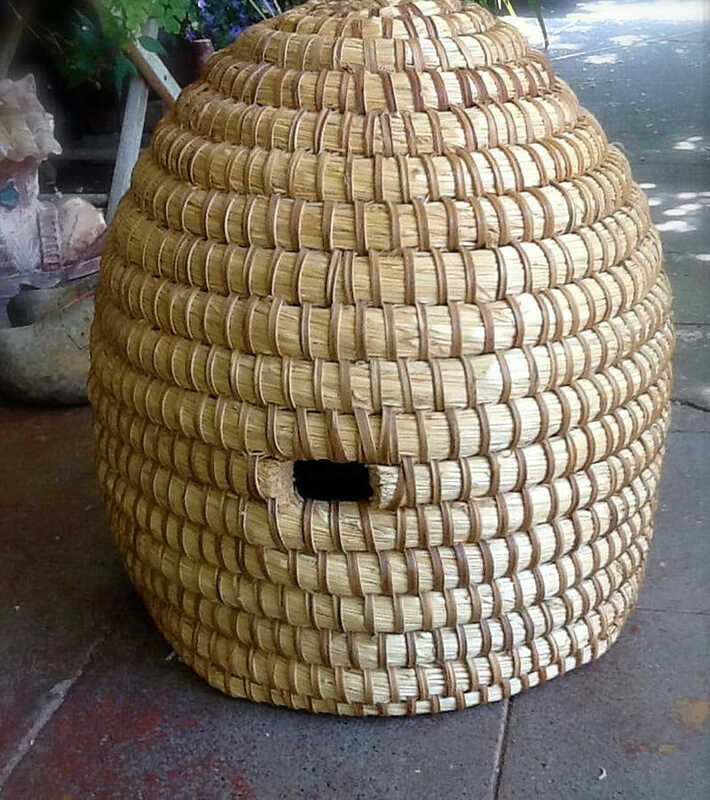 How do I preserve a bee skep for decorative purposes as an antique adornment? Spray lacquer or other resin hardener? Many thanks. Hi, this is a great guide but I would like to know if other types of straws could be used like willow.